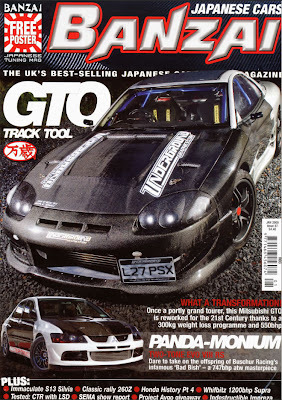 The January edition of Banzai Magazine hit the shelves this month with the Underground Graphics GTO gracing the front cover. Editor Joe Clifford reckons it was something he'd never do - a GTO on the front cover - they're too heavy, old and a bit dated looking. That is unless they've been worked on by Sitech Racing. The GTO always offered speed and comfort, but an extreme weigt loss programme from Sitech Racing has turned this Mitsubishi into a lean, tuned track toy. We knew the photos had been taken and thought we might see a double page in Banzai. There was no way we expected the front cover, a 7 page article and double page pull out poster! Thanks to Adrian Brannan for the immense photos and Andrew Biddle for writing the article.